I have multiple projects and labels to manage, and often find myself on the web app either reaching for the pointer to manually switch between them or using keyboard shortcuts to get to them. On my phone, however, there are no keyboard shortcuts, and I have to dig through the side menu repeatedly to go back and forth between them. 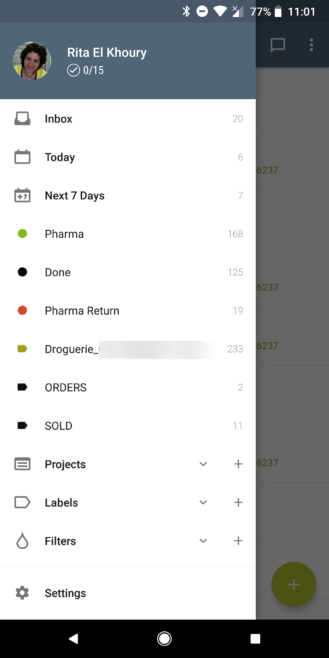 Favorites solves this by letting me pin any project, label, or filter to the top, below the Next 7 Days list. 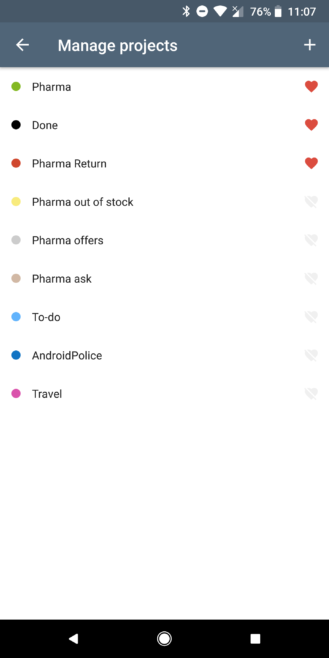 To add an item to favorites on Android, you go to the side menu, expand your projects/labels/filters, tap Manage at the bottom of the list, then select the heart next to the one you want to favorite. I've been using this for about a week on the beta version of Todoist on my phone and was able to pin my 3 most used projects and labels to the top. It saves me a couple of taps repeatedly, every day. The update should be rolling out to the stable version of Todoist now, so be patient if you don't see it yet.